Oprah Winfrey has celebrated many impressive milestones and accomplishments in her lifetime as a media icon as well as as a humanitarian and philanthropist. But one of the achievements that is clearly closest to her heart is founding the Oprah Winfrey Leadership Academy for Girls in South Africa. I talked to Oprah about her inspiration to found the school (put in motion by a spirited conversation in Nelson Mandela's living room), what she has learned from the experience, her hopes for the girls and for expanding the school's mission. 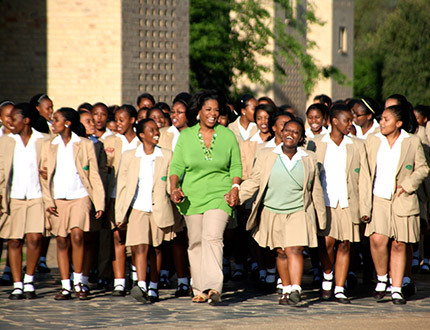 This will also be the subject of an incredibly inspiring special airing on OWN this coming Sunday 10/14 at 9:00 p.m. ET/PT, "The First Graduating Class: Oprah Winfrey Leadership Academy for Girls," which chronicles the fulfillment of Oprah's vision to provide underprivileged girls in South Africa with a world-class education. The special offers an unprecedented look at life at Oprah's Academy, and introduces viewers to the special young women who make up the school's first graduating class, following their journey as they tackle the challenges of their senior year and apply for college. It also features intimate insights from "Mom Oprah" (as the girls affectionately call her), and shows the loving interactions and deep bonds she forms with her students. From their arrival at the school to their first visit to the United States to tour colleges, the special provides personal accounts from the students, who at age twelve or thirteen left their homes and families in poor urban communities to pursue an opportunity to follow their dreams. 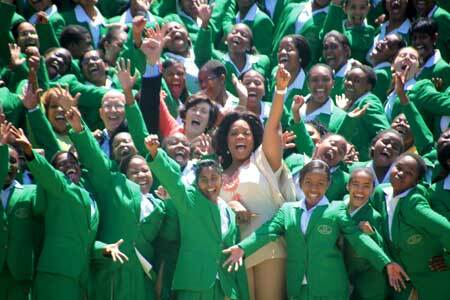 As Oprah talks about in this interview, she understand from firsthand experience how life-changing the gift of a quality education can be, as well as the world-changing potential of being encouraged and emboldened to, as Oprah puts it, "fulfill the meaning of their own creation" and "live out the highest expression of themselves". Marianne Schnall: What inspired you to found the Oprah Winfrey Leadership Academy for Girls? Oprah Winfrey: Being in Nelson Mandela's living room, literally sitting in his living room in 2002 when I had gone over to do something called Christmas Kindness that I just created because my house wasn't ready and I couldn't move in my house for Christmas and I thought what can do for somebody else? And I wanted to do for other kids what had been done for me as a kid the Christmas I discovered there was no Santa Claus - and that was two nuns showed up at the door and brought food and toys to my half-sister and brother and myself at midnight and I never forgot that. And I thought, gee, I want to have that same kind of effect, that you were remembered, that you were valued, you were important, on other kids. That's why I was sitting in Nelson's Mandela's living room - he invited me to stay at his house while we were going village to village bringing gifts to children. And we were having a conversation about what's going to really make a difference in the world. And he said, changing poverty - you can't change the world unless you change poverty, and I said, you can't change poverty unless you educate people, and that's the way through. And I said, 'I would really love to build a school someday for South Africa.' And I really was thinking, ah, someday, that will be the thing that I do when I retire or whatever. And he said, 'you want to build a school!' - he got up, literally jumped up, called the Minister of Education and set me up on the phone with the Minister of Education. And in a conversation with the Minister of Education, by the end of that evening, we were told to come over to the house. So that's how it all started. The other way it started - the reason why I wanted to do a school is because I had tried other things and failed. I had tried creating my own Big Sisters program when I first moved to Chicago. I tried moving families out of the projects to give them a new lease, a chance on life, and what I recognized with all of my failed projects is that unless you change the way people think, you don't change them. You have to start at the core of how they think. So that's why education is so important to me. MS: What do you hope your students have learned from going to the school? OW: What I hope is that they will be able to sit at the table where the future of the world is decided. That they are open to the greatest, grandest possibility that their life has to offer. That they fulfill the meaning of their own creation, that they get to live out the highest expression of themselves - all of that is the open door that our school provides. It's the big wake-up call that there's a whole big world out there waiting for you to offer whatever gifts that you can develop and skills that you can hone through the value of education. MS: It seemed to me that the curriculum at the school isn't just about straight academics but about cultivating many other human qualities and values - how would you describe the educational philosophy? OW: The idea that you are a whole citizen of the world and that this education is to help you gather the pieces to allow you to see the fullness of that. That you are a whole citizen bringing yourself the gifts you have to offer to the world. The idea is the spirit of Ubuntu - is that "I Am Because We Are". The idea is that your life is more enhanced when you can take what you've been given and give to others. So the idea is servant leadership, the idea is the spirit of Ubuntu, "I Am Because We Are" - the idea is using the fullest, highest expression of yourself in such a way that it changes not just you but other people. Have you seen the documentary? MS: Yes, they sent me the review screener and I teared up at many parts of it. I found it so inspiring and moving. Speaking of the special which airs on Sunday, what do you hope people will take away from watching it? OW: That these girls are just like your daughters. These are our daughters. And that the hundred million girls around the world who don't have an opportunity for secondary education are all our daughters. As we celebrate the International Day of the Girl, I think that that is one of my callings on the planet, to be able to use this school as a model to expand and to offer opportunities and to leverage what I have been able to do with this school to affect millions and millions and millions of girls around the world. You know who does the best job of this? The best absolute job of this, that is the model for the world, is The Girl Effect that Maria Eitel is doing. They are doing the most extraordinary work. And I in the future will be collaborating with them with their work so that I can expand the work that I do with my school. Because right now I have almost 400 girls who are continually graduating from school, and that is really a profound thing to do, to offer the country of South Africa a new vision for leadership, that's how you are going to change the world. But to be able to take what I've learned in these past five years and to use that in such a way that it impacts a broader range of girls is also what I am looking to do. OW: I know - I am so excited! MS: I feel like there is a growing realization that these aren't just "women's issues" - that educating and empowering girls and women around the world is interconnected with many other issues that affect humanity. How do you view the significance of educating girls and harnessing the potential of girls' voices? OW: How do I view it? It is THE way - capital THE. It is THE way. Because it's not just rhetoric - it is a fact - that when you change a girl's life you effect her vision of herself and her immediate world and the world that she will have an impact on. That's why all the work that Nike has done with The Girl Effect is just so profoundly outstanding because they have gone into multiple countries and found that if you give a girl a dollar or two dollars, up to 5 dollars a month to be educated, that it changes the entire community. And one of the things that they done is that they go into communities, they speak to the elders in these traditional communities where women have not been allowed to have voices and they go through the men to empower the women. They use the men and then pay the women, these young girls, and these young girls change the families in their community. Time and time again. Because what girls do is they give back. The first thing they want to do is they help their brothers and sisters - they help their mothers. Statistics have shown that when you empower a girl, you don't just change that one girl's life, you change the whole family. MS: I remember a quote came up on the screen during the special, "She who learns, teaches". OW: Yes! Yes, yes, yes. I think we're doing really good work at our school impacting these hundreds and hundreds of girls - my greatest moment, my greatest reward was - I mean, I do a lot - but on the day that we went shopping at Target and Bed, Bath and Beyond? I mean, I was like a crying fool that morning like oh, my god - this is really happening. Not for graduation, but because it means that all of the work - and believe me, it's a lot of work starting a school from scratch more than 8,000 miles away - all of the problems, the crises, the midnight phone calls - literally there have been times when I've flown to South Africa twice in one week. Crazy. While still trying to do the business of my life and shows. And all of it came into absolute, explosive, joyous fruition on the day we went shopping at Bed, Bath and Beyond, because it means - wow - these girls who were in villages, and in poor urban communities, in slums and ghettos, what they call townships - are now going to some of the best schools that the United States has to offer so it is really thrilling. Thrilling with a capital T! MS: What accomplishments of the school and the students are you most proud of? OW: I'm most proud that the girls have been able to - first of all, that first class, every single girl not just graduated, but every single girl is now in college and making all the adjustments that college girls do: "Oh, my gosh - we thought we had a lot of homework when we are at OWLAG, Mom Oprah, the reading - it's overwhelming!" [laughs] That's what I hear. "We're expected to read in one week what we did in a month at OWLAG!" Making all of the college adjustments. And for me it's the great open door. I refer to that a lot because it's not just - I say to them, college is a metaphor for preparation for your life, you know? It gives you four years of a break really before you have to step out in the real world. And what I'm most excited about is a future for them that's so bright that it burns my eyes. I tell them that all the time. MS: I love that it's a "Leadership" academy - that this is about grooming leaders, all that means - their inner leader. OW: We are constantly defining and redefining that for ourselves because in the beginning girls were intimidated by the very name on the school - leadership, because they're like, 'Well, I don't know if I'm really a great leader." Well, there are multiple levels of leadership. Your leadership in your own family, your community, how you lead your life, how you present yourself in the world as one who is willing to use what you have to give to others. That to me the defining meaning of what it takes to be a leader. MS: Some of the most moving parts of the special were when you talked about your own childhood - for example being one of only two black children in a school of 2,000 kids, and having to straddle the line between those two worlds. How did your own personal experience as a child connect to your motivation for founding this school? So I think these girls have done a magnificent job of balancing the two because we teach leadership, we teach speaking up for yourself, using your voice to stand for something that is meaningful for you in your life. And then you go home and you're told that a woman's role is to be silent and to be respectful to your elders, and speaking your own mind and speaking your own truth is not revered, in your family or community. The ability to balance that is extraordinary actually. MS: You have been a pioneer and accomplished so much in your lifetime - in terms of your legacy, what does this mean to you, founding the school and celebrating this graduating class? OW: It means I'm on the right track. The interesting thing about legacy - when I first opened the school I said to Maya Angelou, 'Oh my goodness, this is going to be my legacy.' And Maya said, 'You have no idea what your legacy is going to be.' The truth is your legacy is every life you have ever touched. And that is true for me, it is true for every person who is reading this, it's true for you. The imprint, the heart print that you leave on every person's life that you're exposed to - that is your real legacy. It's the most rewarding, fulfilling - and I would have to say now, fun. I have great relationships with all my girls, particularly the seven who are in school in the United States - it has actually enhanced and uplifted my life in ways that I never even imagined being quote "Mom Oprah". I speak to them regularly, the girls at Spelman are going through midterms so I talked to all of them this morning - this is their first midterm. So the aspect of mothering it's just turned out to be perfect for me, because I probably wouldn't have been good with little kids, with the life that I was leading, and now they're just at the perfect age so that we can share and experience and have real conversations about things that matter. And I can use my life experience, what I know, to help them become more of who they're meant to be. MS: What is the source of your energy? What is it that drives you? OW: I am fueled by my own personal passion to do good in the world. Fueled by that. "The First Graduating Class: Oprah Winfrey Leadership Academy for Girls" airs on Sunday, October 14 at 9:00 p.m. ET/PT on OWN: Oprah Winfrey Network. The two-hour special profiling the first students to complete Oprah's school in South Africa is preceded by the OWN premiere at 8:00 p.m. ET/PT of "Building a Dream: The Oprah Winfrey Leadership Academy," a one-hour special chronicling the creation and construction of the school. See a Sneak Peek of "The First Graduating Class: Oprah Winfrey Leadership Academy"
Marianne Schnall is a widely published writer and interviewer whose writings and interviews have appeared in a variety of media outlets including O, The Oprah Magazine, Glamour, In Style, CNN.com, EW.com, the Women's Media Center, Psychology Today, and many others. Marianne is a featured blogger at The Huffington Post and a regular contributor to the nationally syndicated NPR radio show, 51% The Women's Perspective. She is also the co-founder and executive director of the women's web site and non-profit organization Feminist.com, as well as the co-founder of the environmental site EcoMall.com. She is the author of Daring to Be Ourselves: Influential Women Share Insights on Courage, Happiness and Finding Your Own Voice based on her interviews with a variety of well-known women. You can visit her website at www.marianneschnall.com.